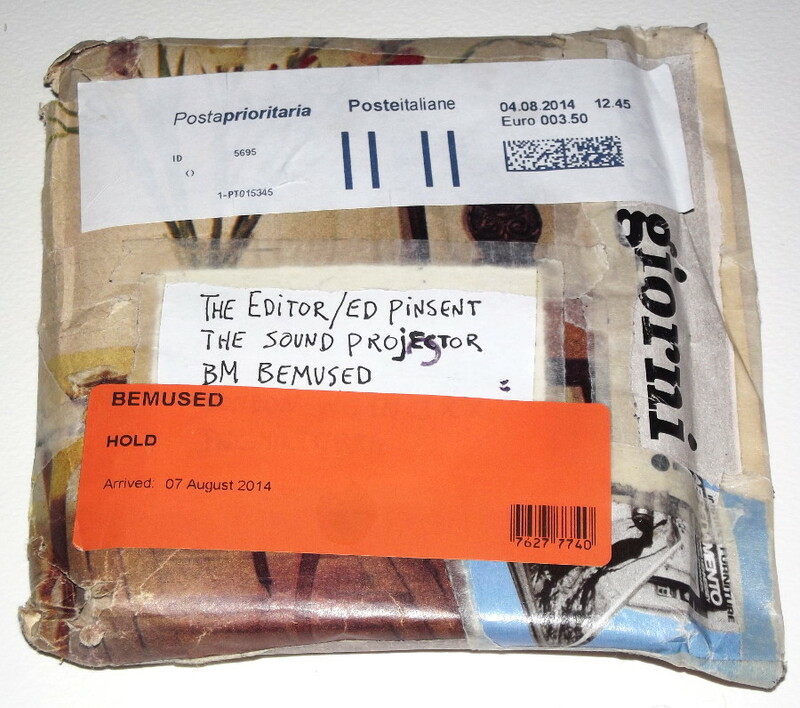 “Here’s two tapes, each of them easy listening items,” writes Rinus Van Alebeek, in letter and package dated 7th August 2014 sent from his Staaltape label. As usual, the envelope is a unique hand-made work of art using newspaper collage, which I regret having to tear open in order to get to the music, so I always photograph it first, as if that could preserve something. 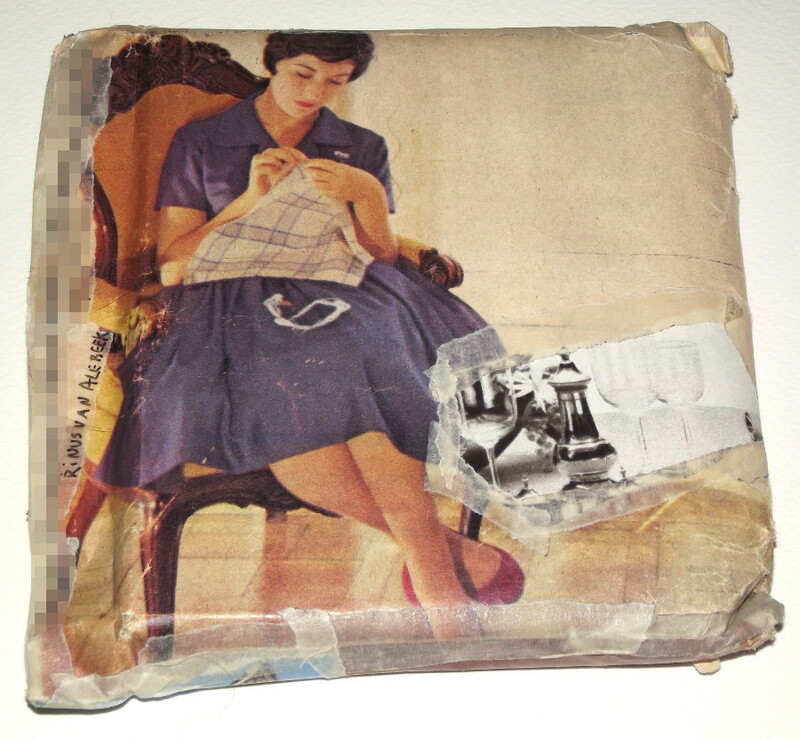 But one of the joys of mailart is surely the way the artwork “changes” as it passes through the mail system. acquiring stickers and marks of distress as it’s handled by man and machine. It’s not meant to survive permanently. Further unwrapping and snipping to be done to open the tapes themselves. The first one I played is The Truth About Cassius Clay, recorded and realised by a Parisian musician called :such:. 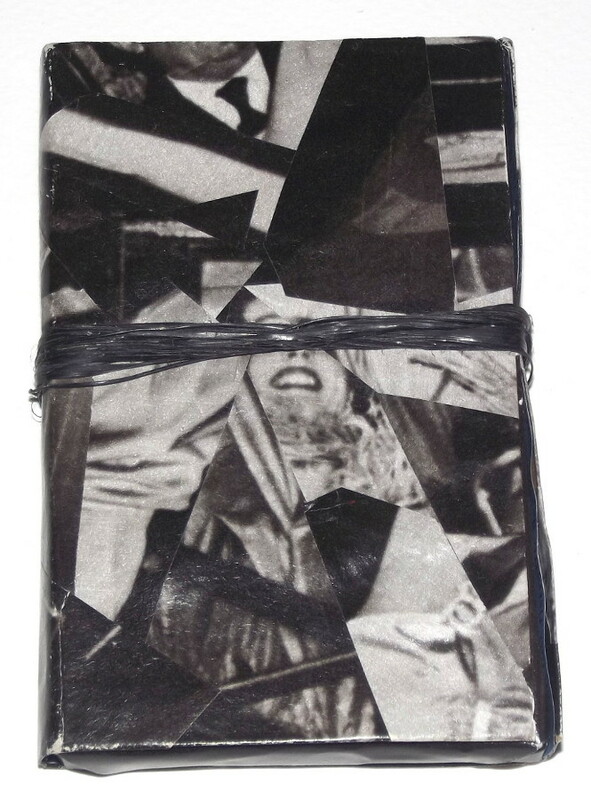 The cassette has a hand-made collage cover, layers from glossy magazines pasted together almost like papier-mache. I suppose the first observation would be that it’s simply gorgeous, beautiful music. 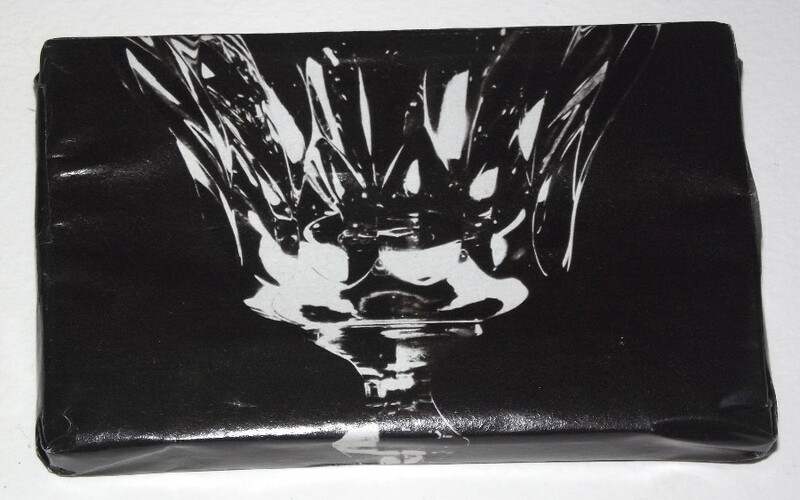 It’s so approachable and accessible that I can recommend this without hesitation to readers who have followed the other Staaltape posts on this blog and decided the whole project is too intellectual, conceptual, or otherwise foreboding in its embrace of cryptic, minimalist sound-art. Van Alebeek is clear: we should not perceive or describe this as “atmospheric” or “ambient” music, glib consumerist labels he has no time for. But to these ears, :such: successfully reclaims ambient music as a viable genre, taking it back from the hands of those who would use it in stereotyped manner to produce “tasteful” drones, to trigger faked or forced emotions in the listener. Here, the slow and processional parade of mixed chords and semi-lush semi-coarse sounds is used much honestly, more directly, to create a genuinely moving experience. It’s also very simple, and largely free from digital processing. :such: arrives at his work through mixing sounds and music sourced from several tape players, hopefully doing it live with many machines running at once. Might it be fair to liken him to Philip Jeck? Jeck’s set-up was far more elaborate of course, and depended to some degree on our nostalgic attachment to old rotating vinyl with scratches, crackles, and varying speeds. Much as I love Jeck, his work often called attention to its own means of production. I don’t have quite the same impression with :such:, whose work transcends its own origins. Not just layers of imaginary music, but also layers of imaginary sounds captured from imaginary cities; for instance, I’m sure I hear a train station buried somewhere in the lucid dream. If so, this fits perfectly with Rinus’ wider scheme, to uncover the hidden truths of city life. 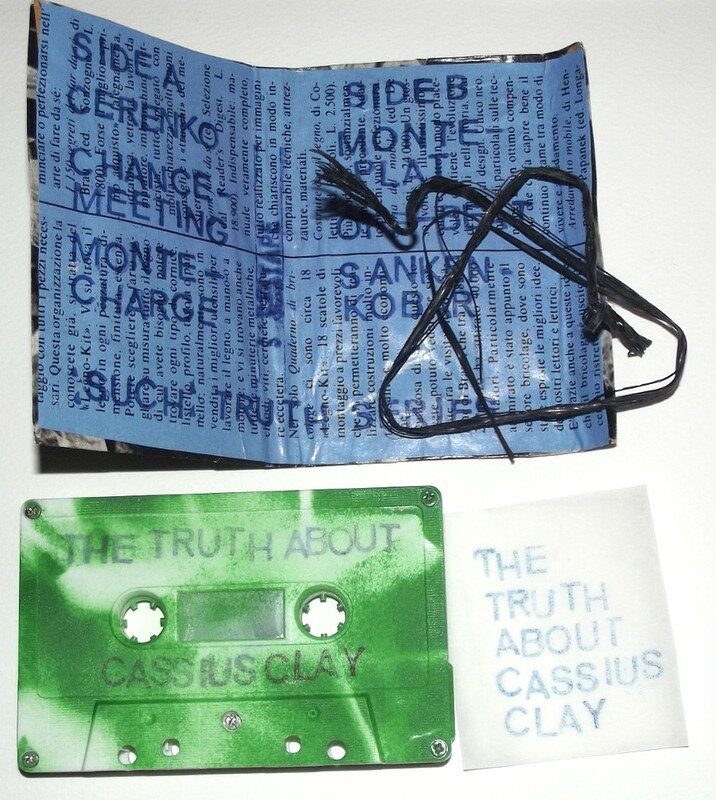 What is the “Truth about Cassius Clay?” It’s part of a series of tapes called the Truth Series. Six tracks have been selected here on this C30, but a total of 12 tracks were commissioned from :such:, produced at the rate of one a month. In total they would create a one-hour album. But for this publication, Van Alebeek has made seemingly random selections from the stockpile to produce 12 new releases of six tracks each, each dedicated to a prominent historical/cultural figure. 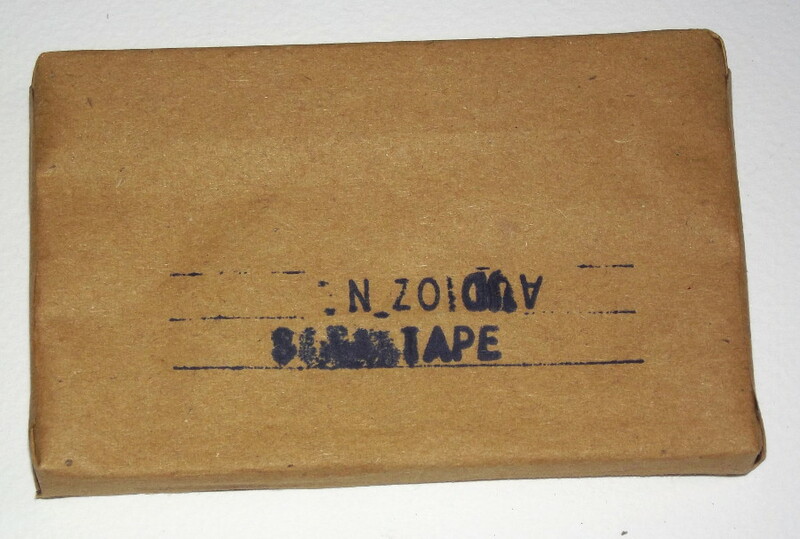 I suppose if you send away for one of these tapes, you are not sure what you will receive. There’s a numeric precision to this strategy that is admirable, but I also love the mutability of it. It isn’t suggesting that the music tracks are interchangeable, but that a work of art can arise from swapping permutations of source material – directly in line with the collage aesthetic of the covers and music. This keeps the art alive, vital; rather than stamped forever into the tyranny of the pressing machine with its matrix and catalogue number. 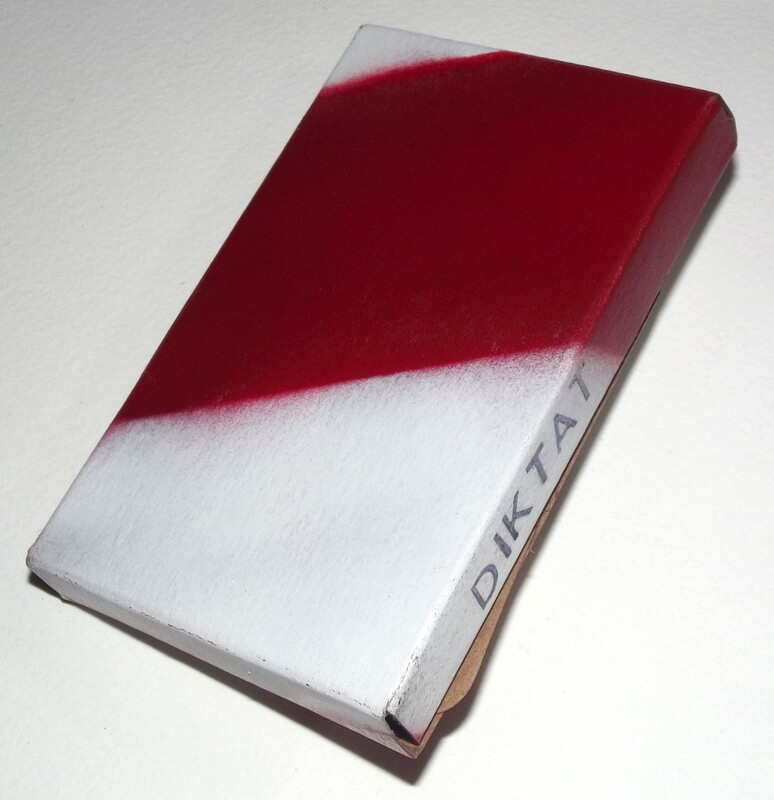 The second tape is by the Diktat group and is called Diktat in America. This performance group comprises Harold Schellinx, Rinus Van Alebeek and Emmanuel Rebus, all of whom play dictaphones, accompanied by Jean Bordé on his double bass. 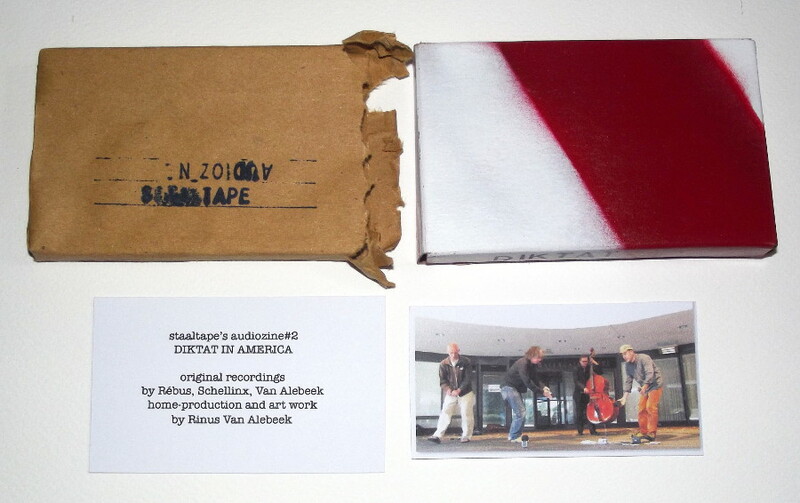 The cassette, #2 in the label’s Audiozine series, does contain some live recordings, but it’s more like an aural diary of their 2012 tour of America; the tape is “an account of that visit”. Virtually nothing conventional about the whole situation; half the time Diktat weren’t even playing in official venues, but doing it outdoors in public places such as the Watergate precinct in Washington DC, or the Williamsburg Bridge in NYC. We hear snatches of them performing music, but also fragments of interviews, chat, meetings, and interesting field recordings gathered from the tour. A bewildering sound-collage results; it’s not always clear what we are listening to, and there’s no attempt to guide us with maps, plot points, diagrams, or titles. Take life as it comes; a stream of audio information. Glenn Branca, whose voice also featured on AudioZine #1, makes an appearance. Come to that AudioZine #1 may have been derived from the same situation and similar source materials, yet it arrives at a completely different result. This fascinating document may not persuade you to follow the music of Diktat, but it will pass on a vivid picture of travel, city life, meetings, people, and the richness of all these things rubbing shoulders in the same melting pot. Without explicitly setting out to capture the “truth” about Washington DC or NYC, this fragmentary-collaged approach (sourced from the tape recorders of all three dictaphone performers) in fact reveals more about direct experiences of places than would be possible with a more considered or formal field-recording / phonography approach. Likewise, as “live albums” go, it’s off the map; equally concerned with presenting the real-world context in which the music was made, the connective tissue of circumstances, as the music itself. 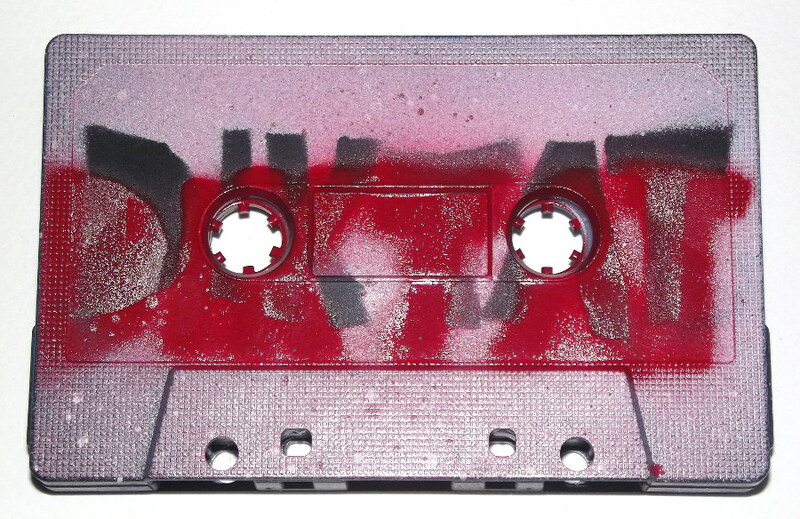 If there is any common ground between these two releases, it might have to do with keeping music and sound alive through various oblique strategies; Diktat’s tape refuses the conventional route of a “live CD” document, and the :such: tape refuses the conventional route of a scheduled album release. Normal listener expectations are derailed. In this way, the art becomes more fugitive, the audience has to work harder to hear it and to find it, and the core of meaning escapes the deadly fate of being pressed in the pages of a book or committed to the mausoleum of a gallery. Rinus Van Alebeek maintains an intellectual rigour and integrity with his releases which, in the anything-goes world of contemporary music, is rare.